Today began a series at North Ridge based on the book ‘Weird’ by Craig Groeschel. The goal of this book, and the sermon series, is to inspire Christians to live “set apart” lives conjunction society. The first message focused on a parable told by Jesus of a wide gate and a narrow gate. As He told it, the wide gate is the easy path that most people took; the path of least resistance, the popular thing to do. Sounds harmless enough, right? Unfortunately for those who choose it, the wide path leads to the certain spiritual destruction. The narrow gate, on the other hand, is the hard way. The way many will try and later give up on, the way that takes discipline. This path leads to eternal life. To show the contrast of the narrow and wide ways, I first pictures two triangles, on resting on its base, the other on its point. To that image I added a braided rope, the two triangles joining together. Last, the triangle on its point, widening as it progressed up the page would blend into the background, to the point that the triangle is indistinguishable from its surroundings. That was my first idea, but I was not satisfied enough to draw it, nothing in that design really set that drawing apart enough to send the message. Alas, time was running out to complete an image, so I began to draw. First the wide path, then the narrow one, last the twisted stem that connects the two. I decided to finish the background at home. 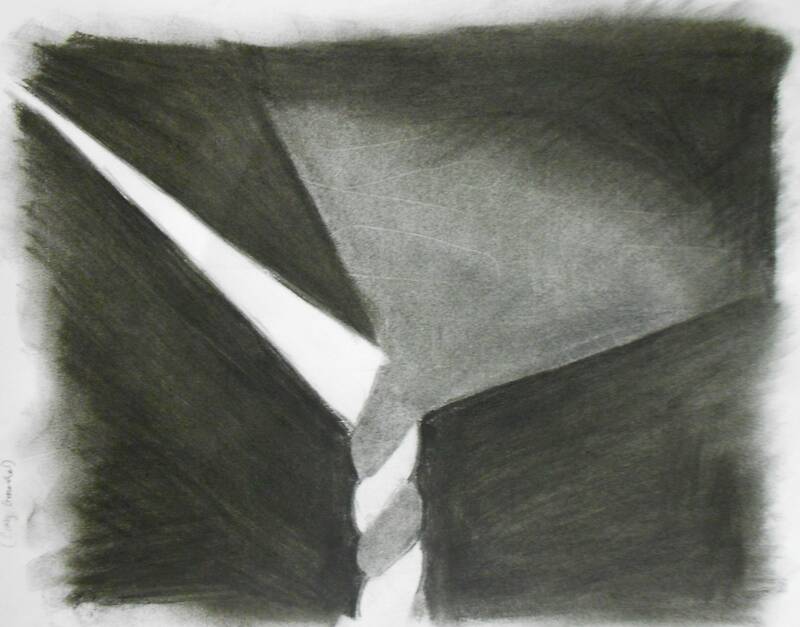 After finishing lunch, I sat down with my sketch pad and a piece of charcoal to finish the drawing. As I stared at the page, I realized what I had drawn. The position of the narrow path, juxtaposed to the wide path, connected by the woven stem became more representational than conceptual. The wide path fans out like the feathers of a peacock, blending from grey into darkness. As the grey vine charcoal blends into the blackness of the compressed charcoal, the fan shape becomes part of the background. The narrow path cuts through the darkness like an arrow, forming a point at the edge of the page where the white paper can escape. Christians who take the wide path blend into society to the point they are no longer Christians, they a deceived into becoming part of the world they claim to be “set apart” from. Spiritually diluted and eventually destroyed. Those who stay the course and hold to the narrow path, find the open freedom of paradise at the end of their road, represented by the Bird of Paradise flower this image seems to silhouette.